A monochrome photograph of a school group annotated at the top '1927' in a card mount with the inscription 'Scholastic Souvenir Co, Bispham Blackpool' at bottom centre. The reverse; has handwritten names: back row D Mckay, McLennon, W McRae (Spag), McLean, ? , T MacBeath, Dougal. 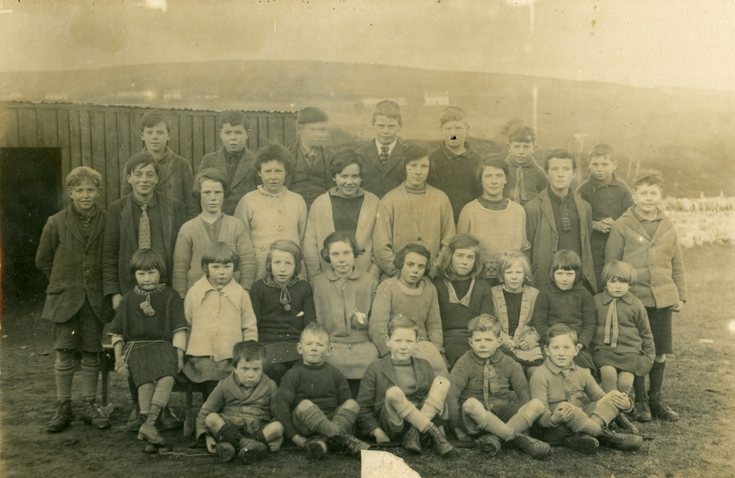 Second from back row: E MacBeath, W Matheson, B McLean, M McKay, N Murray, G Matheson, C Hendry, G Hendry, B McKay, Seated row: W McKay, McLean, D Calder, J Murray, C Matheson, J Marshall, F Sulsor, Iris McFaggen, J McBeath Front Row: D McKay (Spag), D Munro, T Mckay, D McBeath, R Marshall.